Government intervention is not good for economic prosperity. That general observation is both accurate and appropriate, but it might also be helpful to contemplate what sector of the economy suffers the most damage and distortion because of government. In terms of aggregate impact, there’s a strong case to be made that government intervention – via spending, tax breaks, and price controls – wreaks the most havoc with the health sector. In terms of perverse results, it’s hard to imagine a more convoluted sector than higher education, where government intervention causes higher tuition and transfers wealth from the poor to the rich. In terms of all-encompassing, Soviet-style central planning, the plethora of handouts, subsidies, protectionism, and cronyism in the agriculture sector is hard to match. Speaking of agriculture, let’s commemorate Valentine’s Day by exploring how politicians shower sugar producers with undeserved wealth every time one of us buys something sweet for a sweetheart. Vincent Smith of the American Enterprise Institute shares some grim news on who is reaping unearned benefits. Valentine’s Day is here again, and still the US sugar lobby has its hand in everyone’s wallet when they buy chocolate and other candy for their friends and families. For over four decades, the sugar lobby has managed to persuade Congress to maintain a Soviet-style supply control program that, by sharply limiting imports and curtailing domestic production, keeps US sugar prices well above free market levels. 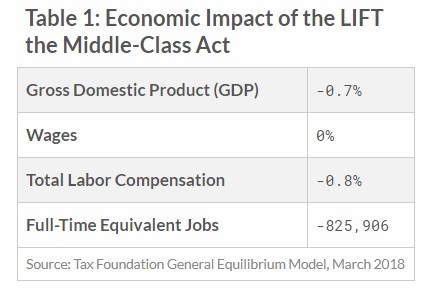 The program costs US consumers an average of about $3.4 billion every year, effectively a hidden annual tax of over $40 for a typical family of four, all to benefit fewer than 5,000 farm businesses. Further, the program raises production costs for the US food processing industry, damaging the food industry’s ability to compete in export markets and causing them to sacrifice a share of the domestic market to exporters from other countries. The impact of the US sugar program on employment for US citizens consistently has been estimated to be negative, costing the US economy between 10,000 and 20,000 jobs on a net basis. While the program creates employment for some workers in sugar refineries, it destroys far more employment opportunities in the US food processing sector by making the sector less competitive. Two of his colleagues, John C. Beghin and Amani Elobeid, produced a detailed study on the topic for AEI. Here are the key findings. The sugar program is a protectionist policy, which increases the domestic price of sugar above the corresponding world price. It restricts imports of raw and refined sugar, depresses world sugar prices, and substantially changes the mix of sweeteners used in processed food. Domestic markets are distorted, sugar users are effectively taxed by the program, and sugar producers are subsidized by it. The welfare transfer to sugar growers and processors is quite large in the aggregate, hovering around $1.2 billion. Losses to households are diffused, about $10 per person per year but large for the population as a whole, in the range of $2.4–$4 billion. …Gains to producers are concentrated in a few hands, especially in the cane sugar industry. Labor effects from lost activity in food industries are between 17,000 and 20,000 jobs annually. For those who like the quantitative details, here’s a table with the most important numbers in the study. Writing for the Federalist, Eric Peterson explains the high costs and inefficiency associated with this bit of central planning. The history of candy canes dates back over 300 years… While this iconic symbol of Christmas saw its first mass production in America, Washington politicians have too often behaved like Scrooge, enacting policies that have sent all but one maker of this holiday classic fleeing abroad. One reason for the mass exodus is the little known U.S. sugar program. 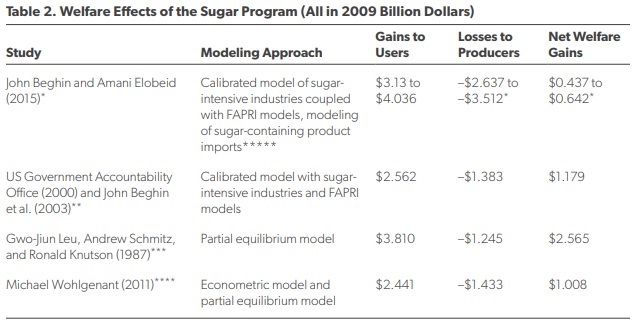 …Government interference in the sugar market comes in four flavors: Price supports, marketing allotments, import quotas, and the Feedstock Flexibility Program. …Although programs such as price supports (which mandate domestic prices for sugar at nearly double the world price) are fairly straightforward, programs such as Feedstock Flexibility are far more opaque. It allows sugar producers to sell sugar to the government at above market value, which the government then sells to ethanol producers at a loss. …Companies that need sugar for their products…can’t even import cheaper sugar from abroad thanks to import quotas that strictly limit foreign sugar. It’s no one wonder that some companies like Atkinson Candy Co have responded by moving some of their peppermint-candy production to Guatemala, where sugar is cheap and plentiful. …Consumers pay higher prices on everything from chocolate to cranberry sauce thanks to these big-government mandates, with the estimated annual costs to consumers and food manufacturers adding up to a whopping $3.5 billion annually. …Since 1997, for example, over 120,000 jobs have been lost in the sugar industry. It’s estimated for every job subsidies prop up, three are destroyed. Notice, by the way, the consistent theme that subsidies and protectionism result in fewer jobs. This is not a surprising result for anybody who has looked at the fourth item in this column. Let’s continue with some more analysis. The Foundation for Economic Education has a column by Ted Ellis on the program. If you’re tired of reading about the senselessness of sugar subsidies, here’s a video on the topic from Reason. It has a Halloween theme instead of a Valentine’s Day theme, but that doesn’t change anything. Let’s conclude with some hard-hitting analysis by Jim Bovard, who explains the tangled web of cronyism for CapX. …the federal government has maintained an array of sugar import quotas and/or tariffs for most of the last 200 years. The regulatory regime has provided windfalls for generations of politicians and jobs for legions of bureaucrats while destroying more than a hundred thousand private, productive jobs. …The sugar program illustrates why politicians cannot be trusted to competently manage anything more complex than a lemonade stand. In 1816, Congress imposed high tariffs on sugar imports in part to prop up the value of slaves in Louisiana. In 1832, a committee of Boston’s leaders issued a pamphlet denouncing sugar tariffs as a scam on millions of low-paid American workers to benefit fewer than 500 plantation owners. …Despite perpetual aid, the number of sugar growers has declined by almost 50% in recent decades to fewer than 6,000. Federal policy failed to countervail the fact that the climate in the mainland U.S. is relatively poorly suited for sugarcane production. …Federal sugar policy costs consumers $3 billion a year and is America’s least efficient welfare program. In the 1980s, sugar import restrictions cost consumers $10 for each dollar of sugar growers’ income. …producing candy and many other food products is far more expensive here than abroad. Since 1997, sugar policy has zapped more than 120,000 jobs in food manufacturing… More than 10 jobs have been lost in manufacturing for every remaining sugar grower in the U.S. …The sugar lobby showers Congress with money, including almost $50 million in campaign contributions and lobbying between 2008 and 2013. In return, members of Congress license sugar growers to pilfer consumers at grocery checkouts and rob hardworking Americans of their jobs. That last segment is the key. Sugar subsidies are a class case of “public choice,” with special interests and politicians both benefiting while ordinary people pay the price. There are many reasons to shut down the Department of Agriculture. But it’s hard to imagine a bigger reason than getting rid of handouts for Big Sugar. Maybe ultra-corrupt ethanol handouts are even worse, but that’s a judgement call. P.S. Since today is Valentine’s Day, here’s a very topical explanation of why unfettered prices are desirable. P.P.S. 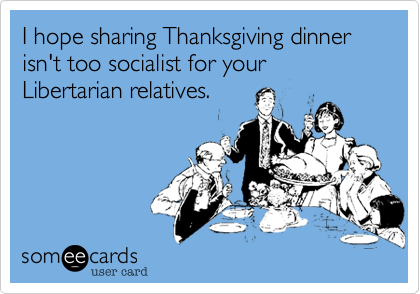 And here’s a Libertarian Valentine’s Day. Or, for my statist readers, here’s Obama’s vision of Valentine’s Day. I explained back in 2013 that there is a big difference between being pro-market and being pro-business. Pro-market is a belief in genuine free enterprise, which means companies succeed of fail solely on the basis of whether they produce goods and services that consumers like. 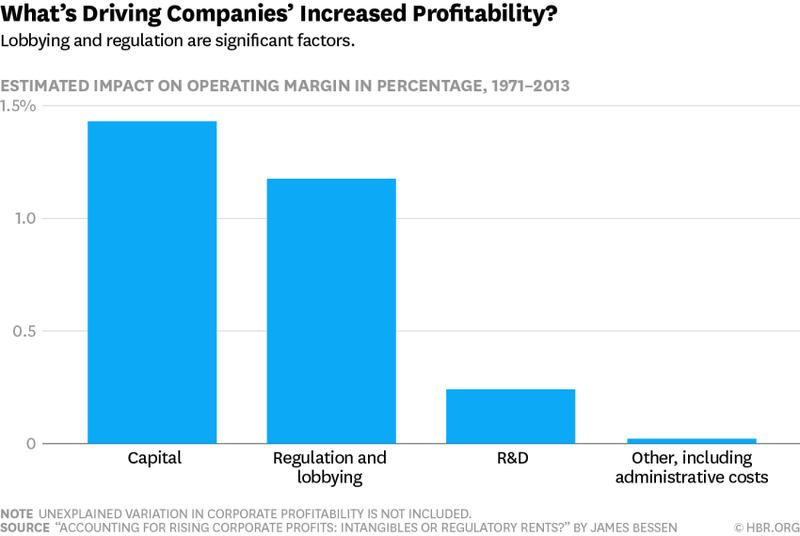 Pro-business, by contrast, is a concept that opens the door to inefficient and corrupt cronyism, such as bailouts and subsidies. It basically means big business and big government get in bed together. And that’s going to mean bad news for taxpayers and consumers. Washington specializes in this kind of cronyism. The Export-Import Bank, ethanol handouts, TARP, and Obamacare bailouts for big insurance firms are a few of my least-favorite examples. But state politicians also like giving money to rich insiders. A report in the Washington Post reveals how states are engaged in a bidding war to attract Amazon’s big new facility, dubbed HQ2. Maryland Gov. Larry Hogan (R) will offer more than $3 billion in tax breaks and grants and about $2 billion in transportation upgrades to persuade Amazon.com to bring its second headquarters and up to 50,000 jobs to Montgomery County. …It appears to be the second-most generous set of inducements among the 20 locations on Amazon’s shortlist. Of the offerings whose details have become public, either through government or local media accounts, only New Jersey’s is larger, at $7 billion. Richard Florida, a professor at the University of Toronto, explains to CNN why this approach is troubling. …there’s one part of Amazon’s HQ2 competition that is deeply disturbing — pitting city against city in a wasteful and economically unproductive bidding war for tax and other incentives. As one of the world’s most valuable companies, Amazon does not need — and should not be going after — taxpayer dollars… While Amazon may have the deck stacked in picking its HQ2 location, the mayors and elected leaders of these cities owe it to their tax payers and citizens to ensure they are not on the hook for hundreds of millions and in some cases as much as $7 billion in incentives to one of the world’s most valuable companies and richest men. …The truly progressive thing to do is to forge a pact to not give Amazon a penny in tax incentives or other handouts, thereby forcing the company to make its decision based on merit. It’s not just a problem with Amazon. Here’s are excerpts from a column in the L.A. Times on crony capitalism for Apple and other large firms. State and local officials in Iowa have been working hard to rationalize their handout of more than $208 million in tax benefits to Apple, one of the world’s richest companies, for a data facility that will host 50 permanent jobs. …the Apple deal shows the shortcomings of all such corporate handouts, nationwide. State and local governments seldom perform cost-benefit studies to determine their value — except in retrospect, when the money already has been paid out. They seldom explain why some industries should be favored over others — think about the film production incentives offered by Michigan, Louisiana, Georgia and, yes, Iowa, which never panned out as profit-makers for the states. …the handouts allow big companies to pit state against state and city against city in a competition that benefits corporate shareholders almost exclusively. Bizarrely, this process has been explicitly endorsed by Donald Trump. …politicians continue to shovel out the benefits, hoping to steer their economies in new directions and perhaps acquire a reputation for vision. Nevada was so eager to land a big battery factory from Tesla Motors’ Elon Musk that it offered him twice what Musk was seeking from the five states competing for the project. (In Las Vegas, this is known as “leaving money on the table.”) Wisconsin Gov. Scott Walker gave a big incentive deal to a furniture factory even though it was laying off half its workforce. He followed up last month with an astronomical $3-billion handout to electronics manufacturer Foxconn for a factory likely to employ a fraction of the workforce it forecasts. And here’s an editorial from Wisconsin about a bit of cronyism from the land of cheese. The Foxconn deal…should be opposed by Democrats and Republicans, liberals and conservatives. There are no partisan nor ideological “sides” in this debate. The division is between those who want to create jobs in a smart and responsible way that yields long-term benefits and those who propose to throw money at corporations that play states and nations against one another. The Foxconn deal represents the worst form of crony capitalism — an agreement to transfer billions of dollars in taxpayer funds to a foreign corporation. …Walker offered the company a massive giveaway — discussions included a commitment to hand the Taiwanese corporation nearly $3 billion in taxpayer funds (if it meets hazy investment and employment goals), at least $150 million in sales tax exemptions…the Legislative Fiscal Bureau, which analyzes bills with budget implications…pointed out that Foxconn would receive at least $1.35 billion and possibly as much as $2.9 billion in tax incentive payments even if it didn’t owe any Wisconsin tax… This is a horrible deal. Let’s now circle back to Amazon and consider how it gets preferential treatment from the Post Office. I don’t feel guilty ordering most of my family’s household goods on Amazon. …But when a mail truck pulls up filled to the top with Amazon boxes for my neighbors and me, I do feel some guilt. Like many close observers of the shipping business, I know a secret about the federal government’s relationship with Amazon: The U.S. Postal Service delivers the company’s boxes well below its own costs. Like an accelerant added to a fire, this subsidy is speeding up the collapse of traditional retailers in the U.S. and providing an unfair advantage for Amazon. …First-class mail effectively subsidizes the national network, and the packages get a free ride. An April analysis from Citigroup estimates that if costs were fairly allocated, on average parcels would cost $1.46 more to deliver. It is as if every Amazon box comes with a dollar or two stapled to the packing slip—a gift card from Uncle Sam. Amazon is big enough to take full advantage of “postal injection,” and that has tipped the scales in the internet giant’s favor. …around two-thirds of Amazon’s domestic deliveries are made by the Postal Service. It’s as if Amazon gets a subsidized space on every mail truck. In this last example, the real problem is that we’ve fallen behind other nations and still have a government-run postal system. 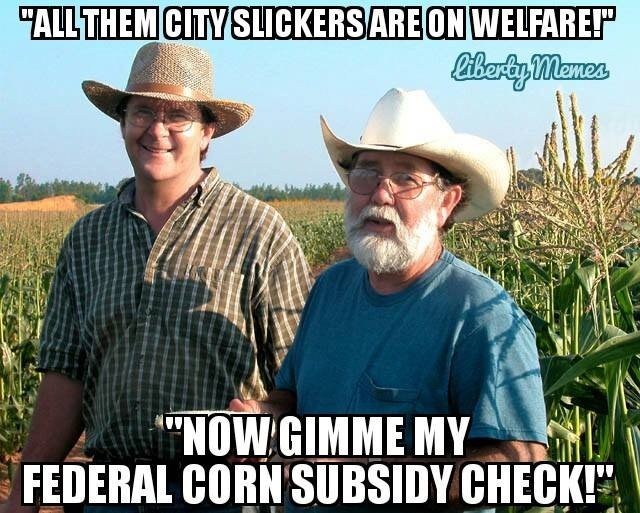 The way to avoid perverse subsidies is privatization. That way Amazon deliveries will be based on market prices and we won’t have to worry about a tilted playing field. And that last point is critical. Yes, cronyism and corporate welfare is an economic issue. It is bad for long-run growth when political favors distort the allocation of capital. But an unlevel playing field is also a moral issue. It’s simply not fair or not right for politicians to give their buddies special advantages. And it’s both economically harmful and morally harmful to create a system where the business community views Washington as a handy source of unearned wealth. For what it’s worth, I also think it should be a legal issue. For those of us who believe in the rule of law, a key principle is that everyone should be treated equally. Heck, that principle is enshrined in the Constitution. So I’ve always wondered why courts haven’t rejected special deals for specific companies because of the equal-protection clause? Then again, maybe I shouldn’t wonder. After all, the Supreme Court twisted itself into a pretzel to miraculously rationalize Obamacare. But none of this changes the fact that it’s time to wean big business off corporate welfare. P.S. Just in case you harbor unwarranted sympathy for big companies, remember that these are the folks who are often keen to undermine support for the entire capitalist system.